The United States and South Korea are expected to restart small-scale military exercises on Monday, a few days ahead of a meeting this week between U.S. Secretary of State Mike Pompeo and North Korea’s second-in-command to discuss denuclearization. As he announced on Sunday that the Trump administration is resuming talks with North Korea, Pompeo noted that he is also supposed to discuss the scheduling of a second denuclearization summit between U.S. President Donald Trump and North Korean dictator Kim Jong-un when he meets Pyongyang’s second-in-command Kim Yong-chol in New York City at the end of the week. “I expect we’ll make some real progress, including an effort to make sure that the summit between our two leaders can take place, where we can make substantial steps towards denuclearization,” Pompeo told CBS’s Face the Nation. The Korean Marine Exchange Program was among the training drills that were indefinitely suspended in June after U.S. President Donald Trump met North Korean leader Kim Jong Un in Singapore and promised to end joint U.S.-South Korea military exercises often criticized by the North. A spokesman for South Korea’s Ministry of Defense confirmed a round of training would begin near the southern city of Pohang, with no media access expected. 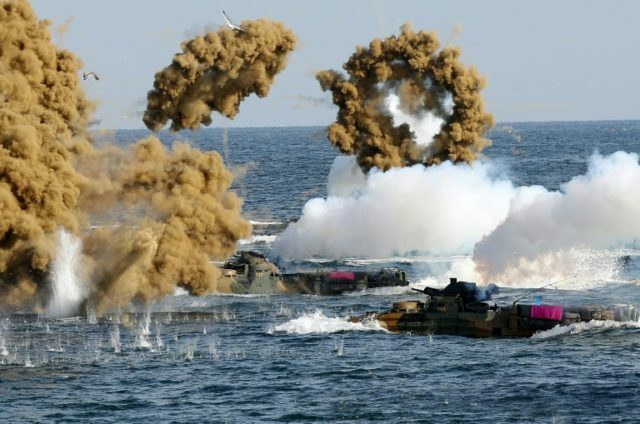 About 500 American and South Korean marines will participate in the maneuvers, the Yonhap news agency reported. On Friday, the rogue North Korean regime reportedly warned that it would “seriously” consider resuming development of its nuclear program if the Trump administration does not lift its campaign of “maximum pressure” and sanctions. The improvement of relations and sanctions are incompatible. The U.S. thinks that its oft-repeated ‘sanctions and pressure’ lead to ‘denuclearization.’ We cannot help laughing at such a foolish idea…As shown, the U.S. is totally to blame for all the problems on the Korean peninsula including the nuclear issue and therefore, the very one that caused all those must untie the knot it made. In an interview on Fox News Sunday, Pompeo dismissed North Korea’s threat that it may resume its development of nuclear weapons. The Trump administration has vowed to keep its sanctions until the United States can verify that North Korea is taking steps towards the complete denuclearization of the Korean peninsula. In recent weeks, North Korea has pressed more sharply for what it sees as reciprocal concessions by the United States and other countries. According to Voice of America (VOA), the announcement that the United States and South Korea would resume military drills comes amid slow progress on ending the North’s nuclear weapons programs in the months since the June summit between Kim and Trump, when the two leaders signed an agreement calling for the denuclearization of the Korean peninsula. Nevertheless, Pompeo told Fox News that the prospective talks present “a good opportunity” to move toward specifics of when and how North Korea might bring about the complete, verifiable, and irreversible denuclearization of the Korea peninsula as requested by the United States in exchange for sanctions relief, among other perks. Despite the slow progress in the Trump administration’s effort to denuclearize the Korean Peninsula, Pompeo cited the presence of favorable signs in the relationship between the United States and North Korea. The United States hopes to finalize a U.S.-North Korea denuclearization deal by the end of the President Trump’s first term in office in January 2021, VOA points out.